﻿ 6 Ways to Use Personalization In Email Subject Lines for Better Open Rates » Red Mango Marketing! Learn how first names and other personalization tricks can make your email stand out. This screenshot is from my personal Gmail inbox, and it’s pretty obvious which email stands out amongst the clutter. 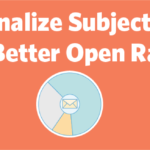 The post 6 Ways to Use Personalization In Email Subject Lines for Better Open Rates appeared first on Constant Contact Blogs. This entry was posted on Wednesday, March 21st, 2018 at 10:55 am	and is filed under Email Marketing, News & Updates. You can follow any responses to this entry through the RSS 2.0 feed. Both comments and pings are currently closed.